Winner’s Mind. Who are you? What does “success” mean for you? What is “Being successful”? There are many descriptions which share the core. However, firstly, it is the inside. In this article, we will try to understand what is special in successful people and what traits are necessary to become one. In order to realise how the attitude towards the situation can influence the person, let’s remember the story of Sultan and the dream interpreters. So, this story reveals the fact that it is significant to keep the positive attitude in any situation and under any circumstance as well as believe in a notion of success. Dr. Denis Waitley (Waitley, D., 1979. The psychology of winning. Berkley Books) talks about 10 qualities of the winner-person. He insists that every person can become successful if he follows them. Self-projection is the act of a clear and distinct image of what you want to achieve. It can be told that it is about the knowing your end goal but it isn’t only that. Instead of just knowing your end goal, create the process of how you are achieving your goal. The majority of people do not have concrete goals, they are not even thinking about them. There are some pseudo goals like “I want to learn another language” or “I want to start my own business”. There are no details in these goals, no steps in achieving them or visualisation of outcomes. Self-projection can also include meditations, mantras, and affirmations. All these are necessary to develop your insights, the winners have. Self-projection is good. Nevertheless, by itself, it is just daydreaming and it is great in the combination with other skills. In order to achieve something real, you have to set the clearly defined goals. There are many various technics in setting the goals. SMART (read about it more detailed in Goals and wishes. What do you actually need?) is one of them. This one is the most effective. Often, people who fail are worried. What if I fail the task? What if my project will get the bad feedback from the boss? What if I will not be able to achieve my goals? There is nothing useful in the worry and fear. These only increase your level of stress and the chance for real failure to achieve your goals. It is much more useful to remain optimistic and keep the positive attitude on the outcomes. Even if not everything will go the way you want, you should not get upset. Think as scientists do: “If this approach does not work, we will try another one”. You have to use your power of self-determination to understand what you really need and then act on it. It is not about you doing the project for your boss but about you doing your own project. When it is yours, you are ready to take the responsibility for failure or success. Everything now is on you, not on somebody’s whim. Actually, nothing and nobody is able to stop a person who has the clear goal in the mind and the positive attitude. Nobody is ideal. All people have their flaws and foibles. To be a winner does not mean to be perfect and always succeed. It is about being aware of your weaknesses and work on them. Self-awareness is about empathy. If you are able to understand what others feel, and you can experience the same feelings, then you have a broad understanding platform. It leads to being ready for changes and flexibility. Such people always know what happens to themselves and with others. They know what to do and even unexpected things will not be a problem for them as the level of their adaptability increased. So, their goal is less likely to be failed. The high self-esteem and self-confidence are significant for being a winner. You should know that if you are acting right, the success will not drive you crazy, and criticism will not lead to decrease the confidence in your abilities. You are aware of all of your strengthens and weaknesses and therefore you have the adequate attitude for both failure and success. People often do not want to hear that achieving success takes a lot of hard work. Many people simply desire to receive the answers, want to find the simplest way which helps them to avoid hard working. In order to achieve your goals, you have to build the habits, which are not easy to obtain, pay less attention to entertainments and train your self-discipline every single day. It is obvious, that all of us have both “angel” and “devil” within our personalities. From time to time “devil” can take the upper hand. To reduce these wins you should write your thoughts and analyse them. Complete people do only what they believe in. They do not bend. They adjust, but do not bend – and this is a huge difference. They have beliefs that they never betray. They draw strength from the inside, not from the outside. The winners have the understanding of time value. They are not getting upset because of the past mistakes, it was good because of the experience it brought. They also will not worry about the future, as long as they have the clear goals. The winners want to act right now, they want to know how to maximise their productivity even when they are spending time with their family and friends. Finally, if you wish to be successful, work on your personality. Remember, that it is difficult to achieve success and you have to work hard and have a very positive attitude to anything happening to you. 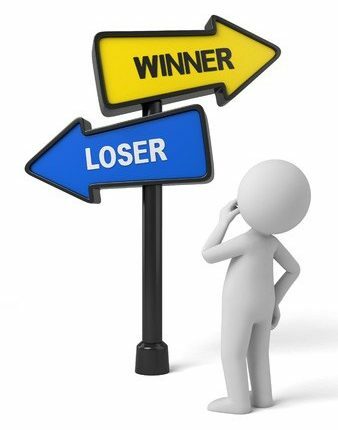 The winner can fail more than the loser but the attitude of the winner will motivate such a person to work more and succeed while the second type will give up and do nothing worrying about the failure. Wish you all the best and remember, the Fly will find the dirty place even in paradise while the Bee will find the flower at the dump. Previous Бизнес – начало начал. Для Вас ли это? Next Психология победителя. Кто ты?